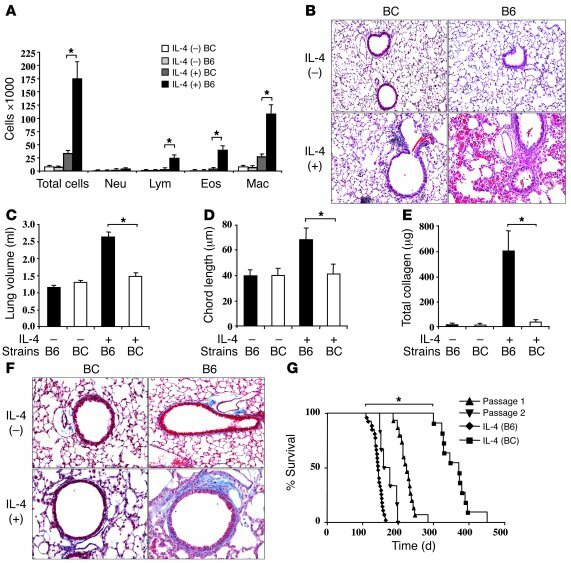 Different phenotypes induced by IL-4 in C57BL/6 and Balb/c mice. IL-4 Tg mice were generated on C57BL/6 (B6) and Balb/c (BC) backgrounds. At 3 months of age, total and differential BAL fluid cell recovery (A), histology (B), lung volume (C), alveolar chord length (D), collagen content (E), and trichrome staining (F) were assessed. The survival of Tg-positive C57BL/6 and Tg-positive Balb/c mice and F1 and F2 backcrosses of Tg-positive Balb/c mice with wild-type C57BL/6 animals is illustrated in G. B and F are representative of at least 5 similar experiments. The values in the rest of the figures represent the mean ± SEM of experiments with a minimum of 5 animals. Neu, neutrophil; lym, lymphocyte; eos, eosinophil; mac, macrophage. *P < 0.01. Original magnification, ×10 (B); ×20 (F).